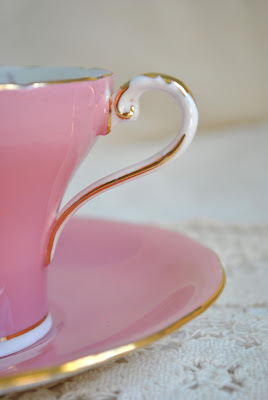 Artful Affirmations: Tea Cup Tuesday Pink! I have a couple of Ansley serving pieces that I use for crumpets and lemon curd. Can't wait to post my second Tea Cup Tuesday post in a few hours. 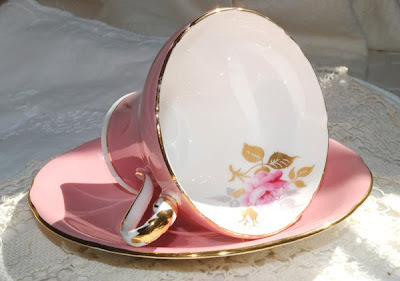 I love pink, and this is a fantastic tea cup! So pretty, and such a neat shape! 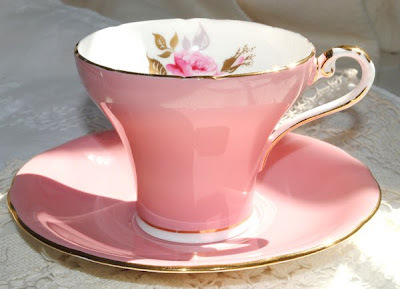 What a gorgeous pink teacup. So delicate and feminine. The pink of your cup is just amazing. Thanks you for hosting. I'm seriously swooning over that luscious pink cup! That is the most beautiful shade of pink. I love your sweet doll...she's just adorable Terri. Terri, I love your pink teacup! I love the colour and the shape; gorgeous! My, there are so many beautiful teacups out there! Thanks for sharing yours. 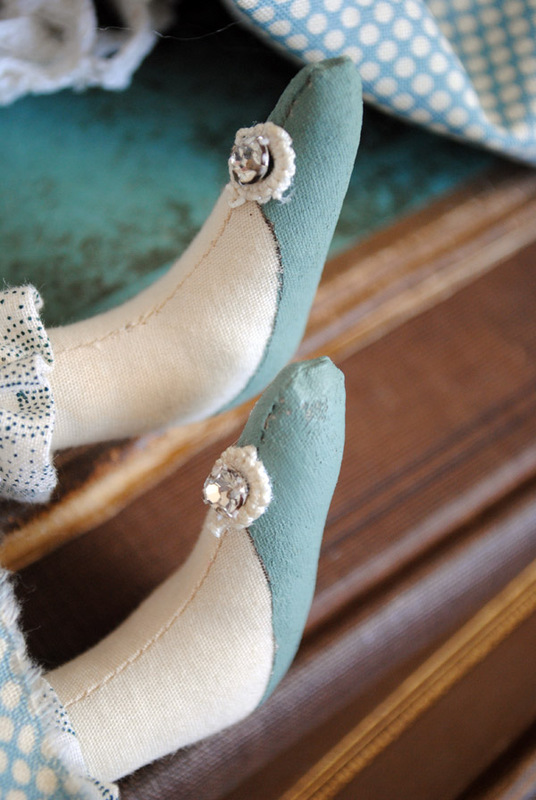 Cute little doll too with her sparkly shoes! Hi Terri - Your pink tea cup is fabulous of course, but I'm afraid I can't help you with the detail you're looking for. I love how delicate it looks, almost like a cotton candy. I of course am loving your fairy doll, especially coz of the sign it's holding and the colors are my favorite. The most elegant shape I have ever seen...and don't you just love the glazing over that pretty pretty colour!? Your doll is adorable too! I love that you sew and craft and love tea cups...we actually have a lot in common! I have signed up for tea cup Tuesday, it has been so long since I've joined in all the fun! Here!s hoping that when I wake tomorrow morning...which will be Tuesday for me....i will remember to photograph one of my cups and post it! Hope your videos are coming along! OMG Terri! This teacup and saucer are absolutely beautiful! I love them. And thank you for the info on the dating of this teacup. Tomorrow I am going to drop by and check out your tutorials! Hi, I just discovered your blog. Your china collection is great and I love the fairy tree house! The doll is awesome too. Have a lovely teacup Tuesday! Before I didn't know how interesting a teacup could be.. thank to you I know it now, I love this weekly post of yours, sharing your teacups with us! This one is a beauty!! Dear Terri, again you awed me with your beautiful teacup! this one is such a beauty! love the colour which is my fave and the shape of the teacup too, very exquisite.. thanks for sharing this! this cup shall go into my wish list! have a great day! Terri! Fabulous post! Such a romantic looking cup..i adore it..love the shape very stunning...lovely! and awwww...your doll os fabulous..I love the charming blue shoess..oh so pretty and so magical! yay..shine on..your creations are magical! I love when you share them...keep em' coming!! Your pink teacup is absolutely divine and your prim doll is so adorable. Have a wonderful day! What a beautiful cup to share with us today, Terri. The color is so pretty and I love the shape. Thanks for sharing how to determine the date too - very interesting. Thanks for hosting! The Doll is stunning ! Well, Terri...I actually woke up...and forgot about posting for Tea Cup Tuesday today...can you believe that? ! I did a second post! Hope you'll stop in, if you haven't already done so! after all of this tea talk, I think I need to go make a coffee! Terri, hi! 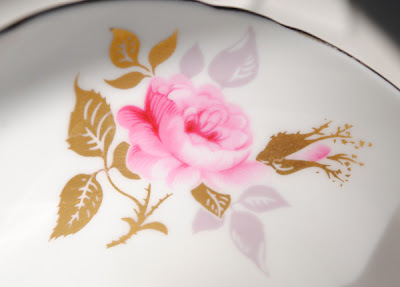 Your teacup is lovely, lovely...The pink is very pretty, and of course the gold leaf and rose add just the right touch, not to mention the elegant shape. That really is a cool system for figuring out the date of the cup. 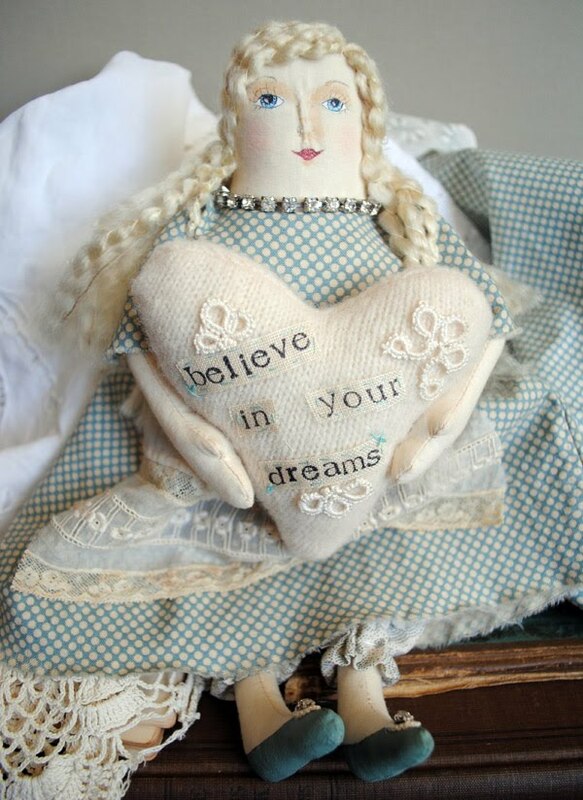 Your doll is delightful (but then all of your projects turn out so well). That swap should be fun. I am looking forward to viewing the second half of the fairy school video...I've been collecting items to make my own. What a stunning tea cup! So elegant and lovely in pink!! And what a beautiful doll that you have created! You are so talented!! That is a gorgeous teacup. I love the pink color and the corset shape. Your prim doll is very sweet. I have fallen in love with your Fairy School! 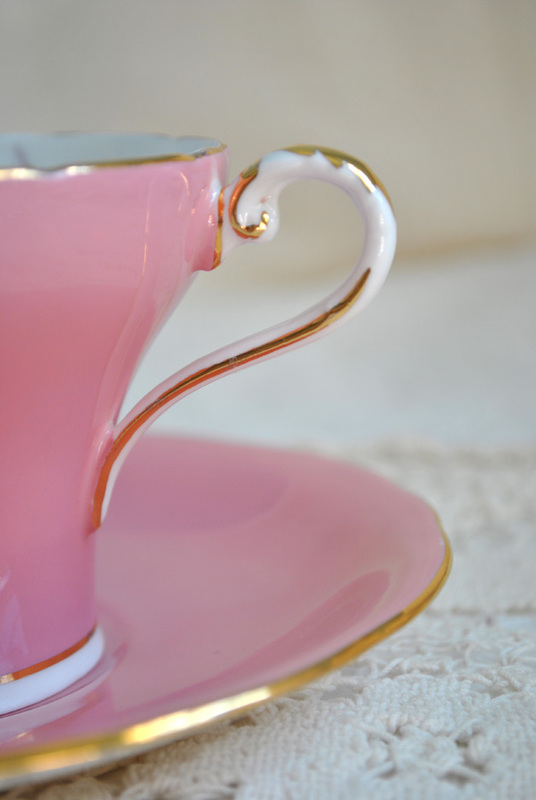 How pretty your pink teacup is! 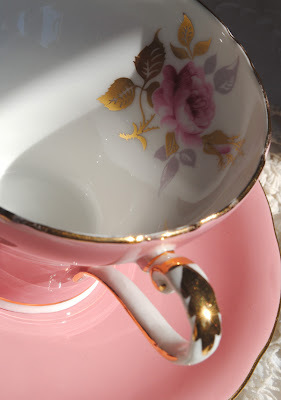 ~ I am drawn to richly hued, rose pink teacups thses day sespecially! Thanks so much for co-hosting the weekly, 'Tea Cup Tuesday', experience with all of us!~ I warmly invite you to also visit Pam and I for, TTTT and also for my 66th, 'TUESDAY TEA FOR TWO' at The Plumed Pen blog...,Fun! Have a marvelous week Terri! P.S.~ Loved your videos by the way, charming little fairy house. I love your pretty pink cup - it is gorgeous. Your fairy doll is awesome. Terri - Terri - love the tea cup and the doll - she brought a smile to my face. I love how you take your photographs! Hugs, girlfriend! 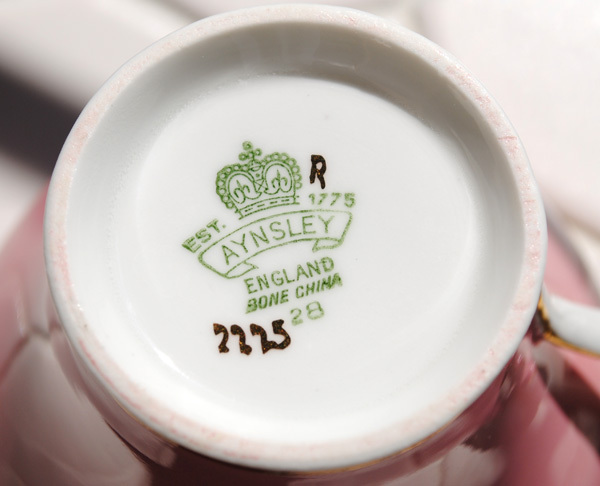 This cup is cute, I love english porcelain, my hobby is collecting cups. This color pink is lovely. Terri, I'm late for your Teacup Tuesday! I have none to share this week but wanted to say yours is soooo sweet! And the little prim doll...oh my! You DO have a way with the needle and thread when you make your dolls. They are always so delicate and the tiny details amazing! Oh my gosh...I just love your new tutorial and your pink teacup. What gorgeous shade of pink. I can't wait to finish up in the house so I can get back to crafty pursuits. It would be so much fun to play in your art room. Thanks so much for sharing your talents with us! Terri, your blog is such a joy to visit. It is a very warm, early Sunday morning here in Western Australia and I have just spent a pleasant twenty minutes savouring the wonderful fruits of your labour. Wow! Terri your doll is absolutely adorable! You are so neat in everything you do...I am in awe! What a beautiful posting! The cup and saucer are exquisite, and I just love the little doll. You did a wonderful job! Do you remember my telling you how I love Wedgwood Patrician? I found the coffee pot last week in a thrift store for $15.00 and it is in perfect condition. I now have one cup and saucer, 1 teapot with a small chip, and a perfect coffee pot (which may be used for hot chocolate. Oh for some tea biscuits, lemon curd and Devonshire cream!